Lots of interesting data out today from State Climatologist Harry Hillaker, but perhaps it’s no surprise that Iowa experienced its coldest winter in 35 years. The past three months – December through February – also ranked as the ninth coldest in 141 years of record-keeping, with March, too, off to a cold start, averaging 20.4 degrees colder than normal. DES MOINES – Iowa Secretary of Agriculture Bill Northey today highlighted a summary of the 2013/2014 winter season compiled by Harry Hillaker, the State Climatologist with the Iowa Department of Agriculture and Land Stewardship. “It has certainly seemed like a long, cold winter and the numbers from our State Climatologist’s office bear that out. Everyone is certainly looking forward to spring,” Northey said. “The meteorological season of winter runs from December 1 through February 28. This past winter season has been the coldest experienced in Iowa in 35 years and ranks as the 9th coldest winter in 141 years of records. Temperatures this winter season averaged 14.7 degrees or 7.2 degrees below normal,” said Hillaker. A colder December was last recorded in 2000, a colder January in 2010 and a colder February in 1979. Historically there have been only 24 winters among the past 141 seasons where all three winter months averaged colder than normal. Temperatures this winter have varied from about ten degrees below normal in northeast Iowa to four degrees below normal over the southwest. The cold has been very persistent this winter with nearly one-half (44) of all days averaging more than ten degrees colder than normal while only four days averaged more than ten degrees above normal. Persistence has been the primary characteristic of the Iowa weather pattern this winter as there have been very few daily record low temperatures set. Elkader has recorded the lowest temperature of the winter with a minus 29 degree reading on the morning of January 28. Slightly more than one-half of all Iowa winters have brought a lower statewide minimum temperature than the -29 recorded this winter. A popular measure of cold weather is the number of days with temperatures falling to zero degrees or lower. The number of subzero days this winter (through March 7) have varied from 15 at Shenandoah to 50 at Decorah while typical seasonal totals vary from 10 to 30 days across Iowa. Not only has the three mid-winter months been unusually cold, so was the late fall of 2013. The second one-half of October averaged 4.9 degrees colder than usual (coldest for the period since 2006). November 2013 averaged 2.9 degrees colder than normal (coldest since 2000). Additionally the first six days of March have averaged 20.4 degrees colder than usual (coldest start to March since 1962). The persistent cold has allowed the soil to freeze to unusually great depths, despite abundant snowfall which acts to insulate the ground from the colder air above the snowpack. 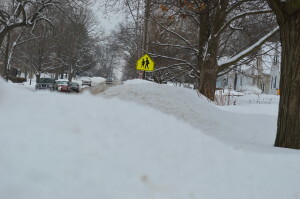 National Weather Service measurements indicate that soils under sod have frozen to a depth of about two to three feet while Iowa DOT data shows the frost depth has extended as much as five and one-half feet beneath roadways. The good news is that the depth of frozen ground has reached its maximum for the winter. The thaw will primarily begin at the surface but there likely will also be a very slow thaw at the base of the frozen soil layer. The best guess is that soils will be completely frost free by about April 10 statewide. Unusually warm and/or rainy weather would accelerate the rate of thaw while persistent cold or snow could delay the thaw even further. While the cold has been very persistent and widespread over the winter, the amount of snow fall has been highly variable across Iowa. Snow totals so far this winter have been as much as 50% less than usual across portions of far western Iowa while the southeast corner of the state has seen about double the usual amounts. County snowfall averages vary from 15 inches in Montgomery County of southwest Iowa to 57 inches in Fayette, Clayton and Buchanan counties of northeast Iowa. The statewide average snow fall stands at 36.0 inches and already exceeds the long-term average with about six weeks of the snow season remaining. This marks the seventh snow season of the past eight with greater than normal snowfall (the long-term snowfall average is 31.0 inches). The current snow cover across the state shows a huge variation. Not only has western Iowa seen less snowfall this winter, they have also had more frequent periods of temperatures above freezing, thus keeping the snow pack to a minimum in that area. Parts of northeast Iowa, however, have yet to see a substantial warm up with Charles City, Northwood and Osage not seeing temperatures climb above 42 degrees since November. As of the morning of March 6 snow was gone from all but sheltered areas over parts of southwest Iowa while depths in excess of 25 inches were common across northeastern areas. What might we expect for spring weather after this long and cold winter? The past two springs have brought an amazing variety of weather to Iowa. The spring of 2012 was the warmest of record in the state and unusually dry. Then in 2013 Iowa recorded a record wet spring along with near-record cold as well. The confidence with long-term weather outlooks is not very high. However, there is an expectation of mostly colder than normal weather for much of the remainder of March. It is worth noting that even a record cold March would still be eight degrees warmer than what we just experienced in February. The NWS spring outlook also slightly favors below normal temperatures for the period through May. There is no strong indication for spring precipitation in 2014. Accurate flood forecasting, as well as drought assessments, depend upon reliable precipitation information. The State Climatologist Office of the Iowa Dept. of Agriculture & Land Stewardship, as well as the National Weather Service, strongly encourage Iowans to become involved in a nationwide volunteer precipitation observation network known as the Community, Collaborative Rain, Hail and Snow Network (CoCoRaHS). This network was established in Fort Collins, Colorado in 1998 in response to a serious flood event and has spread to all fifty states and parts of Canada. Iowa joined the CoCoRaHS network in July 2007. Volunteer observers nationwide utilize four-inch diameter plastic rain gages to insure uniform quality of observations. There is no cost to join other than the need to obtain the standardized rain gage. Data is reported via the internet and various other electronic options with data automatically archived and transmitted to the user community as soon as it is reported. All reporting details can be found on-line at www.cocorahs.org<http://www.cocorahs.org>. Observers are needed statewide with particularly great needs in data-sparse portions of the state such as Adair, Adams, Cedar, Emmet, Keokuk, Louisa and Wapello counties.